Modest, honest and simple, a whole roasted fish prepared with affection embodies everything good about rustic cooking. The skin on whole fish keeps its flesh moist; the cavity acts as a built-in cooking vessel for a side of stuffing; and the bones, through the gelatin they render during cooking, create a naturally occurring sauce that lubricates each flaky, tender morsel. You can free yourself from the constraints of a recipe when roasting whole fish if you follow a few guidelines, such as increasing oven temperature with the size of the fish and keeping the fish as intact during preparation. Check if the fish fits in your oven. Place it in the oven horizontally on a rimmed baking sheet, and if that doesn't work, place it on the pan diagonally. Cut off the head or tail of a whole, scaled and gutted fish, if present. Cut the fish in half as a last resort; you want the valuable cavity space for stuffing. Set the fish aside in the refrigerator while you build a stuffing for it. Rinse the fish inside and out with cold water and blot it with a paper towel. Place the fish horizontally in front of you on the work surface. Cut diagonal slashes in each side of the fish, spacing each about 2 or 3 inches apart. Make the slices 1/4 to 1/2 inch deep, depending on the thickness of the fillets, but don't slice all the way through the fillets. Slashing, or scoring, the fish prevents it from curling in the oven and helps it cook evenly. Coat the fish inside and out liberally with fat. Use a flavorful fat, such as butter, extra-virgin olive oil, sesame oil or grapeseed oil. Lay the cavity open and season it to taste with kosher salt and freshly ground black pepper. Line the bottom of the cavity with thin citrus slices. Use your citrus of choice; the goal is to create steam during roasting, with flavor as a bonus. Lay whole, fresh herb sprigs on the slices for fragrance, if desired. Spread the stuffing in an even layer in the cavity. Make slits along the bottom of the cavity with the tip of a knife and sew the cavity shut with kitchen twine. Place the fish in the fridge while the oven heats. Add one or two primary flavoring ingredients for the stuffing to a mixing bowl. For example, to take the dish in a Mediterranean direction, start with halved cherry or teardrop tomatoes and shaved fennel. For a classic stuffing, add a few cups of freshly chopped herbs. Other options include starches, such as fragrant rice, and vegetables, such as sliced zucchini or eggplant. Add a secondary favoring ingredient to the stuffing. Incorporate pungent ingredients that are best incorporated judiciously so as not to overpower the fish, such as shallots and garlic. Add a fat to the stuffing. If you're making classic herb stuffing, add softened butter; for a lighter stuffing light, consider extra-virgin olive oil. Add finishing ingredients, such as fresh herbs, olives or capers, and season the stuffing to taste. Chill the stuffing in the refrigerator for 30 minutes to an hour so the flavors can meld. Set the oven to between 350 and 450 degrees Fahrenheit. Use the 350- to 400-F range for fish under 5 pounds and the 400- to 450-F range for fish over 5 pounds. Coat the fish with olive oil and season it to taste with kosher salt and freshly ground black pepper. 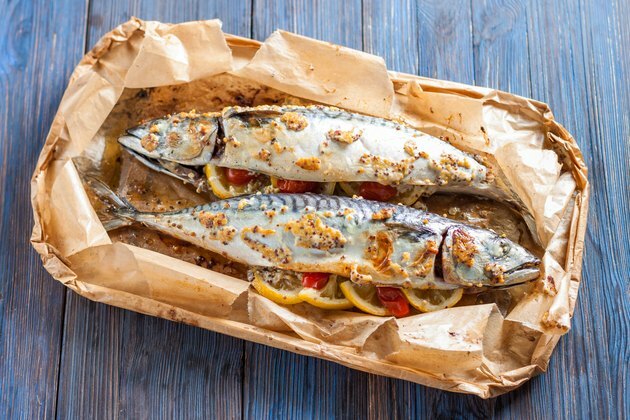 Line a rimmed baking sheet with parchment paper and place a wire roasting rack on it to keep the fish elevated during cooking. Place the fish in the oven. Roast fish that weigh 3 to 5 pounds for approximately 30 minutes. Check the temperature inside the cavity for doneness using a digital thermometer. Fish in excess of 5 pounds roast for about 45 minutes and should have an internal temperature of 145 F or flake easily with a fork when ready. Take the fish out of the oven and remove the twine if you sewed the cavity shut. Cut the fish crosswise into portions or leave it whole and serve it family-style on a platter. Heat the oven to 350 degrees Fahrenheit. Rinse the fish inside and out and pat them with a paper towel. Add a secondary ingredient to a shallow baking dish. If the fish is the lead, the secondary flavoring ingredient is in a supporting role. Use just about any ingredient: tomatoes, onions, fennel and zucchini, to name a few. Coat the fish with olive oil and season them to taste inside and out with kosher salt and freshly ground black pepper. Lay the fish in the baking dish, spaced about 1/2-inch apart. Drizzle the fish liberally with olive oil and add a topping or flavorful garnish to the top. Try lemon slices, minced garlic, chopped fennel and freshly chopped herbs with the fish. Roast the fish for about 10 minutes per pound, until the flesh flakes easily with a fork, or the internal temperature reaches 145 F.
You or your guests can remove the bones from most small fish, such as brook trout and porgies, easier after the fish are roasted because they curl away from the flesh; don't worry about deboning them before cooking. Instead of a roasting rack, slice an onion into 1/2-inch-thick slices and lay the fish on the slices to keep it elevated during cooking.